Make the garlic puree Preheat the oven to 300°. In a medium enameled cast-iron casserole, combine all of the ingredients. Cover and braise in the oven until the garlic is very tender, about 1 hour; let cool to room temperature. Using a slotted spoon, transfer the garlic cloves to a mini food processor and puree until smooth. You will have about 1 1/2 cups of garlic puree. Strain the oil from the casserole into a 1-quart heatproof jar and discard the aromatics. Let the oil cool completely, then refrigerate; reserve for another use. 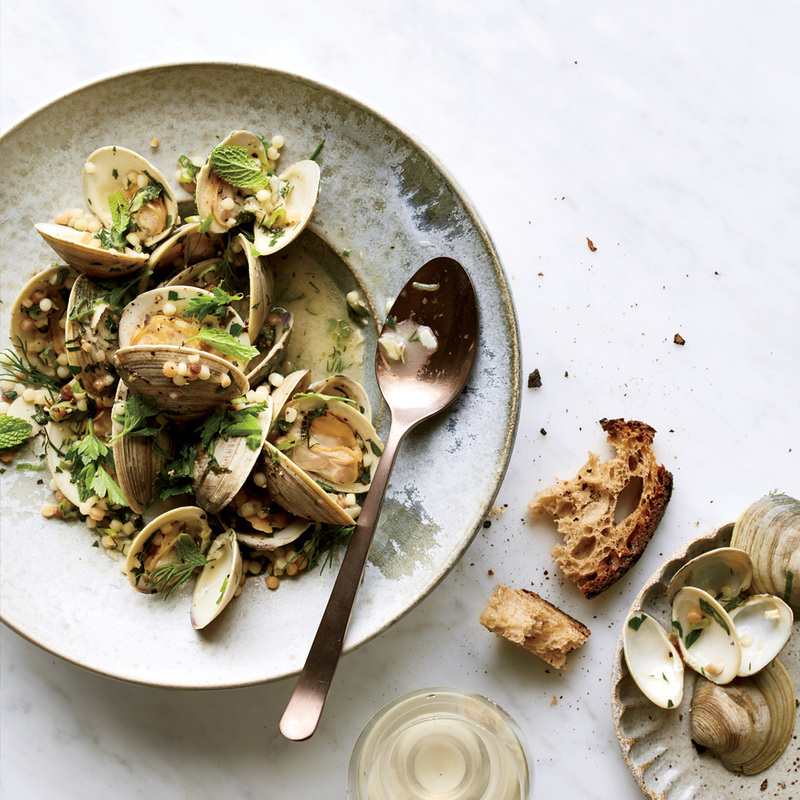 Make the clams In a medium saucepan of salted boiling water, cook the fregola until al dente, 10 to 12 minutes; drain well. Meanwhile, in a large pot, heat the oil. Add the sliced garlic and cook over moderate heat, stirring frequently, until softened, about 2 minutes. Add the clams, wine and 1/4 cup plus 2 tablespoons of the garlic puree and stir to coat the clams. Cover and cook over moderately high heat, shaking the pot occasionally, until the clams open, 5 to 7 minutes. As they open, use a slotted spoon to transfer them to a serving bowl; discard any that do not open. Add the fregola, lemon juice, scallions, chopped herbs and more garlic puree, if desired, to the broth; season with salt and pepper. Pour the garlic broth over the clams and garnish with chopped parsley and dill sprigs. Serve immediately with lemon wedges and crusty bread. The garlic puree can be refrigerated for up to 2 weeks or frozen for up to 1 month. Review Body: This was SO good! I made a few small changes, but I think it would be good as written too. I added fennel when I added the garlic to the 'clams' portion of this. I misread the amount of garlic for the puree and added only 3 cloves, not 3 cups and just prueed the garlic and some of the oil. It was so yummy. I also added about a cup of chicken broth to just before adding clams, because I love dipping break in the SAUCE!! I also added tarragon to the wine/broth mixture. Review Body: seems a good candidate for dinner.